« Classic Look “Mini Ham Can” Air Cleaner. Published by Cyril Huze December 21st, 2016	in Editorial and Wheels. 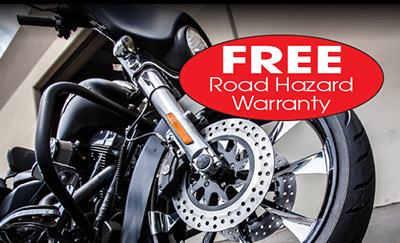 Simply complete the warranty form with the tire dealer at the time of purchase to activate the Road Hazard Warranty. If a tire becomes unserviceable as a result of an eligible adjustable condition during the first 1mm of tread wear, a replacement will be offered at no charge. The warranty is valid on any new tire up to the first 1mm of tread wear and covers normal road use only. Incorrect inflation, off-road use, racing and deliberate damage will invalidate the warranty. Great tires and great warranty make selling Avon tires easy. Phil is right, I have used the warranty once, absolutely no hassle and nice not to have no plugs in my brand new $250 tire. As for performance, been on them for thirty years, they are the very best!! !